A combination of factors make it virtually certain that Putin will emerge as president in next year's elections. The continued ambiguity over who will stand is but a calculated game played by the authorities, says Grigorii Golosov. In 2012 Russia will hold its presidential election. The second-rung candidates are already reasonably clear. Gennady Zyuganov, leader of the Russian Communist Party (KPRF) declared his intention to stand early on; Vladimir Zhirinovsky, leader of the Russian Liberal Democratic Party (LDPR) is likely to join him. Both politicians head parliamentary parties that are more or less controlled by the authorities. Both took part in the last set of presidential elections, gaining 18% and 9.5% of the votes respectively. Both are unlikely to do much better this time around. Alongside these candidates, it is possible that another second-rung politician will also be allowed to run, such as Andrey Bogdanov did in the 2008 elections (he took 1.3% of the vote). But what there cannot be is the prospect of a genuine opposition candidate taking part: Russian legislation on political parties and elections virtually eliminates this possibility. 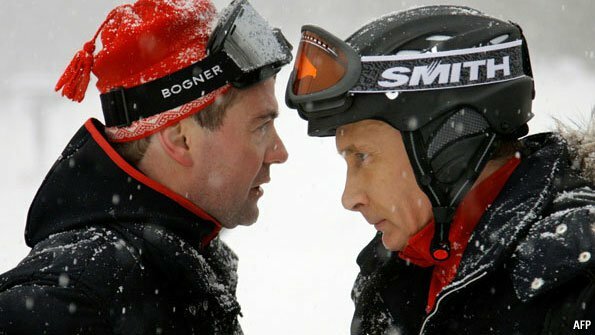 Instead the main question surrounding the Russian elections of 2012 is the question of succession: which of the current president (Dmitry Medvedev) and current prime minister (Vladimir Putin) will be chosen as the official government candidate. Whichever politician is put forward as candidate will win the election – that much is certain. Both have on several occasions emphasised that they would not run against one another. I would suggest that it is reasonable to take such declarations at face value: we should assume a decision will be the result of an agreement reached between the two men. Not too long ago, they also stated that no final decision had been made. Here it may well be that the contrary is true, and that they are absolutely sure of whose name will be on the ballot paper. There are two key reasons why they would not rush to make such a decision public. The first is that as soon as a decision is announced, any influence the non-candidate once had will be significantly reduced. This will have a negative impact on the ability of the Russian administrative apparatus to function as it will cease responding to the orders of the “lame duck” politician. Both politicians, in fact, have responsibility for significant chunks of government policy. If government is to be effective, it is extremely important that orders they give are not ignored by the people below them. The second reason is that the Russian propaganda machine is desperate to avoid the 2012 elections being presented as a ballot with one choice, devoid of political intrigue. The ideal scenario for the authorities would be for the result to be guaranteed in advance, but for the population to be fooled into thinking it was able to affect the results. For this trickery to work, you have to show, for as long as you possibly can, that the result has not been decided a priori. The authorities did this last time around, when they encouraged doubt in the media over who out of Putin, Medvedev, Sergei Ivanov and others would run in the 2006-7 elections. Today, discussion of a “crack” in the tandem has become a very prominent theme in many media publications, while interestingly the same publications remain extremely cautious about commenting freely on other political issues. As president, Medvedev plays a central role in the institutional structure of the Russian regime. On paper, the Russian Constitution affords him colossal powers. He may, for example, dismiss Putin at any time, without even having to give a reason. 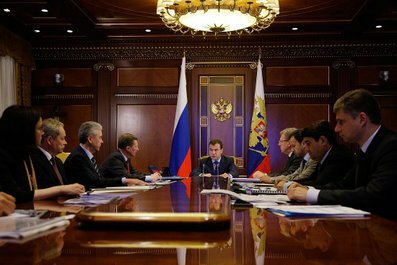 However, in a system of hands-on micro-management, Medvedev’s room for manoeuvre is limited. 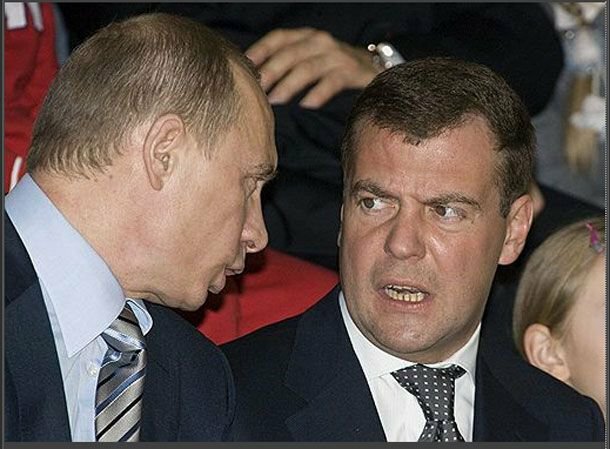 Throughout his entire presidential term, Medvedev has avoided making key governmental appointments, which would, albeit in a small way, have demonstrated a desire to impose effective control over the apparatus of management. Putin’s men still occupy all the key posts — not only in the Russian government (formally at least, Medvedev is in charge of all governmental appointments) but also in Medvedev’s own staff, the presidential administration. Of course there are many decisions that Medvedev can and does take independently, without consulting Putin. The point is that they do not relate to the most important, strategic government positions.The configuration of Russia’s current political regime will, most likely, determine who inherits the throne. This regime is really a dictatorship of one man, camouflaged by its democratic institutions. Real power has belonged to Putin before, during and after Medvedev’s election as president. It is Putin who controls the behemoth Russian administrative apparatus, and he does so by a mechanism of micro-management: Putin gives personal orders to key bureaucrats he trusts, and these bureaucrats ensure that his orders are carried out according to their own material interests and the government resources under their control. In such a set-up, all key decisions are taken directly by Putin, or at the very least are subject to his personal approval. Russia's narrow "ruling group", formed in Putin's first term, could in theory switch to Medvedev's side, but it's too much of a risk: too much for them to lose and too little to gain. With this in mind, let us examine the possibility that Medvedev and Putin, being completely satisfied with the current state of play, agree to continue operating in tandem, with Medvedev remaining president. The problem with such a decision is that it would require Medvedev to give Putin an absolute guarantee — one without a shadow of doubt — that he would not look to broaden his influence in the future. But giving such a guarantee would be very difficult. Following the recent change to the Russian Constitution, the presidential term is now six years. For Putin, the risk that Medvedev may give into temptation during that time, and begin to exert the full range of his formal powers, is surely too great. Moreover, any attempt by Medvedev to broaden the sphere of his influence would infringe the interests not only of Putin, but also of the political clients surrounding the former president. This narrow circle — let us call it the “ruling group” — first took shape in the course of Putin’s first presidential term and has not yet undergone any significant rotation under Medvedev. It answers to Putin and depends upon him, yet at the same time it is influential enough for Putin to consider its interests when coming to any particular decision. Members of the ruling group control either key segments of the governmental apparatus or significant material resources and usually have both at their disposal. Naturally, they compete with one another. In principle, this could lead to one or another of the ruling group switching sides and aligning with Medvedev. Such a move would, however, be too much of a risk for the ruling group as a whole. The source of their power and property is Putin himself, and any undermining of his position might also bring with it a more widespread shake-up of the resources that they currently control. The individuals concerned would face the prospect of relative advancement or absolute loss. The rational strategy in such a situation would be to support the status quo. Therefore for this small ruling group, whose opinions could be sought in deciding which of Medvedev or Putin will stand, the candidacy of Putin is preferable. Of course, on the periphery of this circle, among the less influential players, the balance between possible gain and possible loss if Medvedev were to turn into a real leader is more clear-cut in the favour of the former. There are also some groups, wielding some power and influence, that have formed in Russia in more recent years, and are therefore not directly dependent on Putin. No doubt these kind of groups would welcome any weakening of the mechanisms of Putin’s micro-management. But in truth their influence is limited, and indeed we should not forget that Medvedev himself belongs to the narrow ruling group and shares its fundamental interests. The prospect of turning into a new Gorbachev, who shook up the system only to see power taken away from him, is unlikely to be attractive to him. As for the players who fall outside this narrow ruling group, we can safely say that there is no chance that they will affect the decision on who stands. The positions of official political parties — including those parties that serve as pillars of the regime (e.g. United Russia) — will count for nothing. Obviously were a strong opposition to emerge, able to mobilise public protest, it could have a significant impact on the government position. And indeed, opinion polls have shown an increase in views that are critical of the regime. Were these views to find expression in political activity, the ruling group might indeed consider a candidacy other than Putin’s. However, since the pressure being applied on the authorities is extremely weak, there is currently no need to do this. Finally, the West could also play a limited role in the decision. The ruling group are extremely keen to be integrated into the international economic and political elite. Against this are two points. First, such keenness plays a secondary role to the preservation of power and property. Second, there are few grounds to suggest that the return of Putin to the presidency would result in any serious sanctions from the West. On the contrary, history has shown that Putin is capable of supporting mutually-agreeable relations with the USA and Western Europe; while the prospect of Medvedev achieving anything more than that isn’t immediately clear. There are therefore no players or external factors, either in Russia or abroad, that will cause Putin to turn down the chance to return to the presidency in 2012. Of course, no one can rule out the appearance of such factors in the months that remain, but the probability is extremely low.